Epoxies play a key role in improving the performance of sports and leisure equipment for both amateurs and professionals. Epoxies are being used to produce tennis rackets, skis, golf equipment and hockey sticks, which have become lighter, stronger, more reliable and more resistant to fatigue. Other sports use equipment and gear coated with epoxy resins, such as fishing rods and poles, kayaks, jumping poles, bicycles, archery bows, arrows, etc. 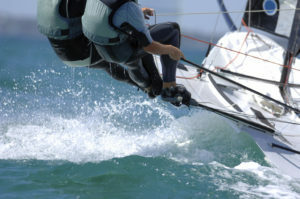 In addition, epoxies play a key role in the maritime industry, providing coatings for small and large boats used in a variety of water sports. The sports and home improvement sectors combined use up to 25,000 tonnes of epoxy resins annually produced by ERC members. Epoxies are not only manufactured and used at an industrial level. Epoxies are used as sealants, adhesives and mortars in home improvement. They can repair wood and plastics, providing strong, durable and resistant sealing. It is estimated that 260,000 tonnes of adhesives and sealants – made with epoxies but also other materials – are sold each year in the EU for do-it-yourself uses. Epoxy resins can be found in your local do-it-yourself or hardware store, often sold with the hardeners. If you are a private user of epoxy resins, remember that epoxies should be handled by experienced operators following strict personal safety measures. For more information, visit our Safety & Sustainability section.